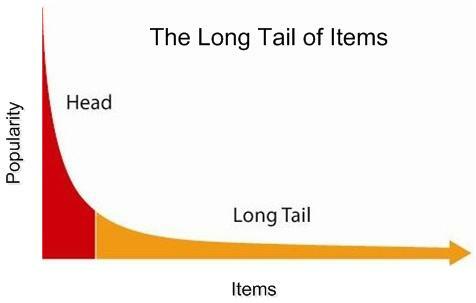 Just as Internet-based retailing allowed Chris Anderson's Long Tail (of Items) to be uncoiled, I suggest that Internet-based pricing is poised to enable the uncoiling of a similar Long Tail of Prices. Anderson’s Long Tail is a tail of items ranked by units sold. As described in his Wired article and book, online merchants like Amazon and Rhapsody can stock many times more titles than brick and mortar stores, since they have essentially no limit to shelf-space. A result, it turns out that half of Amazon's total sales are accounted for by books that are not even stocked by a Barnes and Noble store. The well-known curve shows a plot of the number of items sold, ranked by popularity. 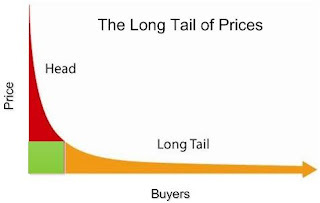 Similarly, The Long Tail of Prices is a tail of potential buyers ordered by the price they are willing to pay. Conventional set prices lop off the tail by refusing to make sales to those unwilling to pay the set price. This eliminates a potentially significant market, out of fear that selling to those buyers will cause the other buyers to demand lower prices. Conventional set prices also lop off the top of the fat head, since the seller gets only the set price, even from those who might be willing to pay more. So revenue is only the green box, even though there is a red surplus at the top of the head, and a long amber tail to the right. This shows the huge opportunity that FairPay opens up. With FairPay, prices are individually set, based on what buyers are willing to pay (subject to sellers using feedback on FairPay reputation to weed out free-riders who don't pay at an acceptable level, as explained more fully in my FairPay introduction). For digital products with near-zero marginal cost, the acceptable price level, for at least some buyers, might be very low. This means that the Long Tail of Buyers might turn out to contribute a very large portion of total revenue. Large numbers of buyers at low prices, who would not otherwise be buyers, can add up to a very large revenue figure. Yes, there is a concern that sellers might find that revenue from some of their current market drops (the curve shifts downward), because buyers have freedom to pay less than the conventional set price. It may at first seem that sellers could not tolerate the risk that many FairPay buyers might pay well under standard prices. That is the usual problem with Pay What You Want pricing. The trick to making FairPay work is that it gives the seller a new ability to selectively manage the offer process by framing the offer and using feedback effectively to incentivize most buyers to pay at a reasonable level, and to screen out those who do not (again, see my article, and some of the other posts here). To the extent that is done, the new revenue from their previously non-addressable market can become a very large total. And also, even though many current buyers might pay a bit less, some might be motivated to pay more. FairPay changes pricing from a seller's game to a cooperative dialog with buyers, leading to a mutually beneficial exchange. So the areas under the curve in red and amber potentially represent found money, money that would otherwise be left on the table. Why not sell to all who will pay more than the marginal cost of the product? Since prices are individually set, low prices to some need not imply low prices to all. If you can get buyers to consider fairness, and to look at this value exchange, most will accept that there are reasons why some deserve lower prices than others. And why not try to motivate your happiest customers to pay a bit more? If you position that payment as going to a good cause (like museums and artists do), some who can afford to pay more will see reason to do so. Enlightened businesses recognize the value of likability -- this is a way to capitalize on being likable. It is not a matter of altruism, but simply of practical economics, on a basis that takes broader market factors and behavioral economics into the equation, and using a more dynamic and cooperative process. The FairPay Zone Blog -- Why not?